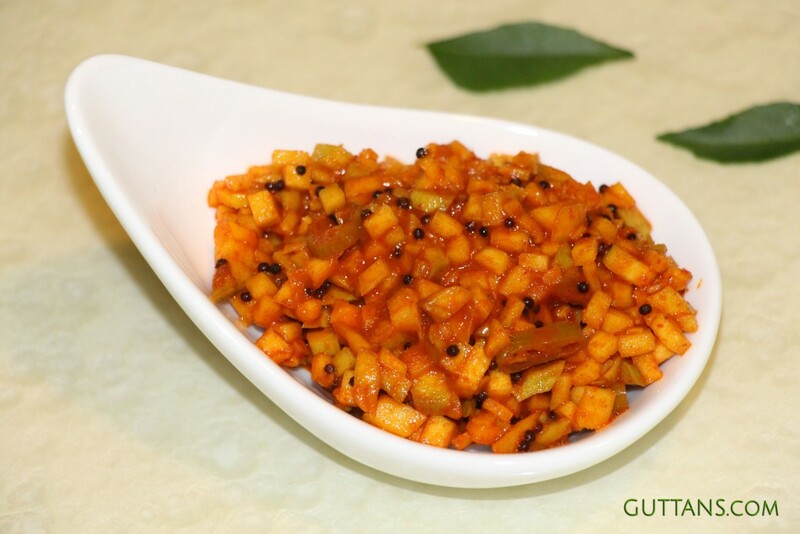 Kerala Mango Pickle is a tangy recipe made using raw mangoes and spices. Kadumanga Achar is usually made while on Onam Sadya spree. Mango Pickle is made using sesame oil, mustard seeds, fenugreek seeds, asafoetida, garlic and curry leaves. Mango Pickle or Manga Achar is one of the pickles served on banana leaf during traditional Kerala Sadya as a side dish during Onam, Vishu and occasions. It is also called as Kadumanga Achar in some parts of Kerala. Prepping : Wash the raw mangoes and wipe them with a kitchen towel. Peel the mangoes with a peeler and cut into small pieces. Add salt in the mangoes and keep aside for 30 minutes. Heat gingelly oil in a pan and splutter mustard seeds. Add dried red chilies, curry leaves, ginger, garlic and green chilli and saute well. Add chilli powder, turmeric powder, fenugreek powder and asafoetida powder. Saute for 1-2 minutes, until the mixture turns a dark reddish brown and fragrant. Add water, bring to boil, reduce the flame to low and cook till the mixture is thick. Add the mango to this mixture and stir for about 10 seconds and turn off the heat. Taste and add salt if needed. Remove it from the stove top and allow it to cool completely and store in a glass jar. Keep outside for two to three days for the flavours to set in and then refrigerate the pickle. The longer you keep pickles sealed and stored in a cool, dry place the better they taste. Longer they are allowed to blend in with the spices the more they absorb flavours and taste better.